Small (5-6) - $86.99 Only 2 left! Your little one lives for winter. What a dream: a kid who doesn’t mind bundling up and going out in the cold! The trouble is that ever since you moved to Florida, it’s become a LOT more difficult for her to manufacture her beloved winter fun. Take last year’s attempt to freeze your pool into a skating rink by filling it with individual ice cubes from the freezer—we give her points for trying. Or the fact that she’s always showing up to school overdressed with a container of hot cocoa. She sometimes even paints her lips blue when you’re not around, in the hopes it may inspire her teeth to chatter! And let’s not forget last year’s tour de force, when she took the economy-sized vat of baby powder and dusted “snow” onto all of your bushes and windowsills (not to mention the poor cat). Why not beat her to the chase this year and invite “winter” to come early with this Child Icelyn the Winter Princess Costume? She’ll delight in ushering in frigid temps (as she sits directly in front of the AC) in royal fashion. 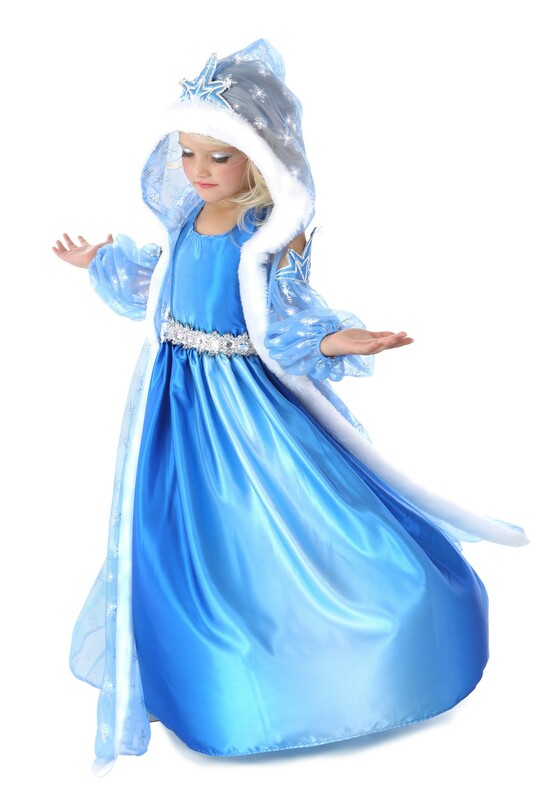 Once your little princess has this glacier-blue, glitzy getup, she’ll feel so frosty she can abandon her messy antics and make believe her way to a winter wonderland. Details like this jacket’s faux-fur edging and glittering snowflakes may even inspire her to turn her Halloween party into a wintry gala, complete with an ice castle, sledding, and fresh fallen snow. That shouldn’t be too hard to execute in Miami, should it?